THE NATIONS OF THE NORTH AMERICAN PLAINS – PART 2: ASSIMILATION OR ANNIHILATION? The magpie, though a lesser spirit than the Thunderbird, still served as an elite messenger to the heavens. The buffalo. 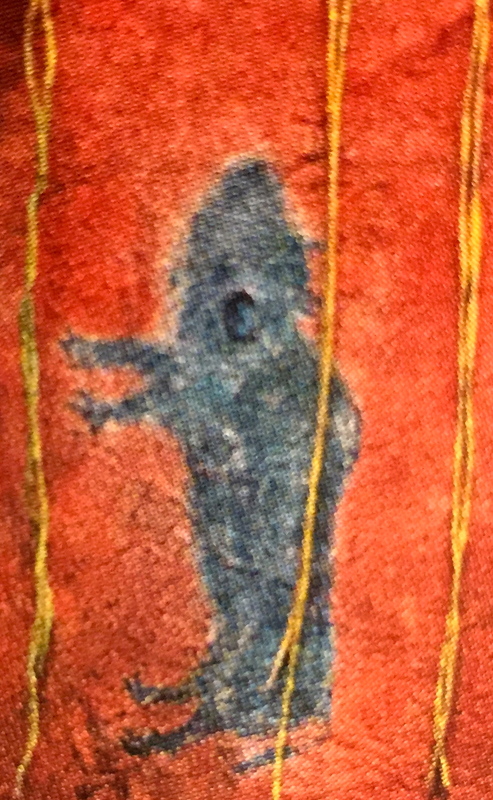 stars, as well as pictures (on the front of the dress) of the sun and moons are elements of the earth and sky, along with man, represented by the hand. 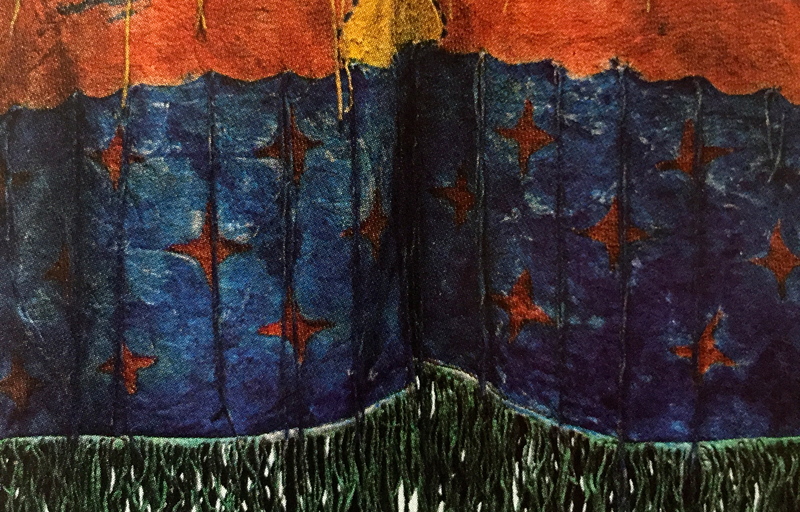 In total, the imagery of the dress evokes the entire universe in all its glory. Why did the Ghost Dance and its ceremonial dress, such beautiful representations of a world in peace and harmony strike such terror in the minds of the white settlers that it provoked a sorrowful and shameful event such as the Massacre at Wounded Knee? Let’s take a deeper look at the history of the dance. ROUND DANCE – Around 1870 there was a Northern Paiute spiritual leader named Wodziwob, also known as Grey Hair, had a prophetic vision. In this vision Wodziwob saw a world of renewed hope and plenty. Based on his vision, Wodziwob began to preach that the People could help bring about the revitalized world of his vision by performing rituals. One of these, a “round” dance at night would invoke the spirits to bring back the good life. This vision appeared right as the US Bureau of Indian Affairs was in the midst of its “assimilation” program. What actually occurred, however was a systematic destruction of tribal customs, forcing previously nomadic families to settle on reservations, while their land was confiscated. In addition, bearing a striking resemblance to the “Stolen Generations” of Australia, the children of the People were sent to English-language boarding schools and prevented from speaking their native tongue. As these indigenous tribes were driven off their lands, many suffered from starvation and disease (many new germs brought to them by the European invaders). To add to the People’s misery their sacred buffalo, once numbering in the millions was on the cusp of extinction due to overhunting. With such daily struggles at hand, the teachings of Wodziwob caught on and many tribes adopted the rituals. However, after a number of years with no results, the Paiutes lost faith and gave up the dance. GHOST DANCE ~ One Paiute shaman, Wovodka, who had experienced the round dances in the 1870’s had a vision of his own while ill in 1888. 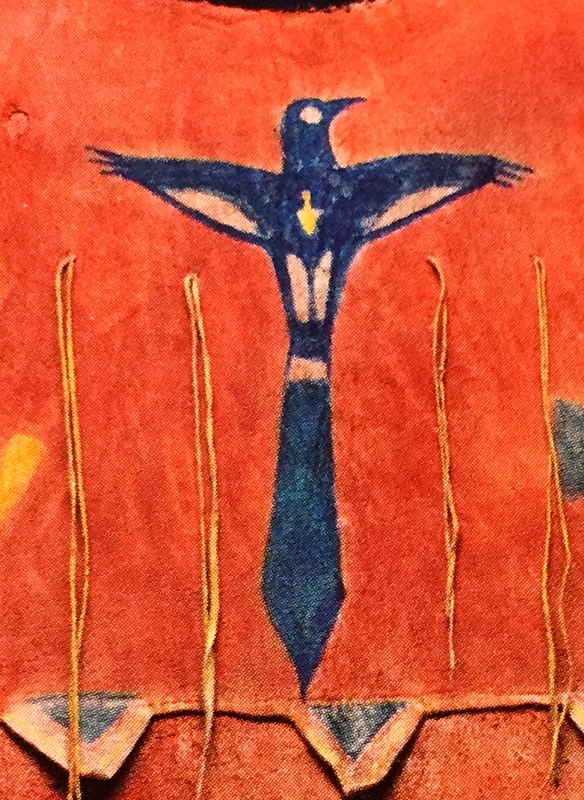 Deep in the spirit world he saw Paiute warriors rise from the dead to a world renewed and healthy. He also saw the earth swallow up all the white people so that the newly resurrected Indians could enjoy the world free from their oppressors in peace and harmony once more. 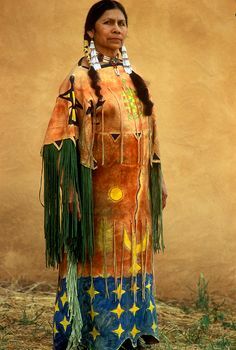 Wovodka began to preach that based on what he was told by the gods, the Paiutes could hasten this “renaissance” and return to traditional ways by continuously dancing the Round Dance. He believed that with this dancing, even the buffalo would return. And the Ghost Dance was created. Sitting Bull’s Lakota Sioux were continually harassed while their sacred land was parcelled out to white settlers. Sitting Bull was a smart man and he recognized his people’s need for something to believe in, all the while being cognizant that the Ghost Dance would not actually bringing the dead back to life. He was also aware that the Ghost Dance was disturbing the BIA (Bureau of Indian Affairs) as the Lakota version differed from the Paiute’s generally non-violent tones by emphasizing the possible elimination of the white settlers. 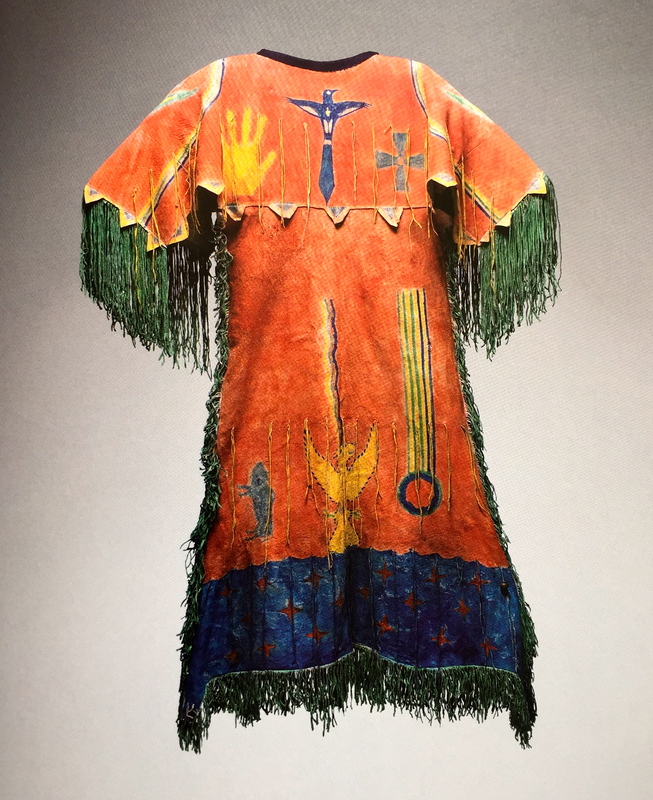 It was even thought that the Lakota fashioned “magical” Ghost Shirts” which were suppose to protect the wearer from bullets. 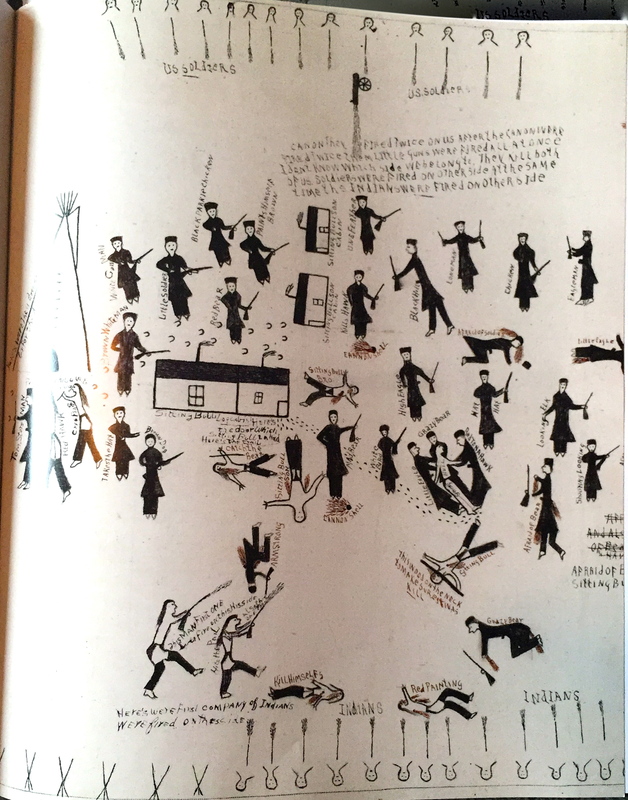 “The Arrest and Death of Sitting Bull” was painted by an unknown Lakota artist who illustrated Thomas Stone Mann’s (a Dakota policemen who witnessed the event) accounting of the incident. That is Sitting Bull dead in the lower right quadrant with a lance across his neck and an annotation, possibly written by Mann which reads: “This wood on the neck to make sure it was kill” (sic). Also murdered in this melee was Sitting Bull’s son shown here with blood streaming from his armpits right below the cabin. The Ghost Dancing continued despite this tragedy and 14 days after Sitting Bull’s death, the US Army, in an effort to quell what they believed to be an uprising decided to once again relocate the Lakota. 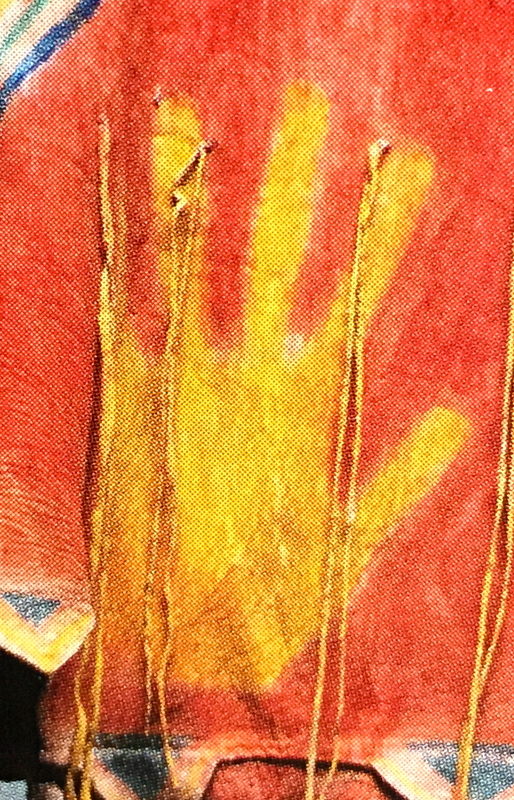 A band of 350 Lakota, mostly women, lead by a chief named Big Foot had been Ghost Dancing for their lost husbands and other men in previous battles with Custer and other US soldiers came to Pine Ridge Reservation in the mistaken belief that they would be provided protection against further atrocities. Though they surrendered on December 28, 1890 the Lakota were taken to Wounded Knee Creek, escorted by the US Military and set up a temporary camp. The following morning, December 29, 1890, the military ordered all Lakota weapons to be taken and burned. Some Lakota refused and in the rising agitation a shot was fired from an unidentified source, and literally all hell broke loose. Pandemonium ensued, with the Sioux screaming and trying to flee while the troops mowed them down – over 290 men, women and children were brought down in a few bloody moments. Approximately 33 soldiers were killed – ironically most from friendly fire and Medals of Honor were bestowed on 20 surviving soldiers. The Ghost Shirts, in the end did not protect the People from the bullets. This entry was tagged aboriginal, ART, ARTIFACTS, ASSIMILATION, ATROCITIES, CALVARY, canyonlands, CHEYENNE, COMMANCHE, CULTURE, CUSTOMS, GHOST DANCE, INDIGENOUS, LAKOTA, MILITARY, NATIVE AMERICANS, PAWNEE, PLAINS INDIANS, RESERVATION WOUNDED KNEE, RESERVATIONS, SIOUX, SITTING BULL, TREATY, TRIBE. Bookmark the permalink.